Category: Bracelets. 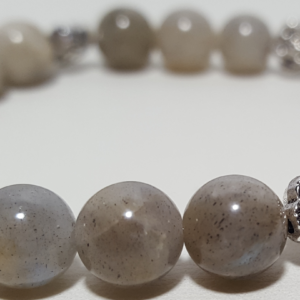 Tags: bracelet, calming, empathy, fertility, liver, lucid dreaming, managing change, menstrual problems, moonstone, pancreas, pms, psychic ability, soothing. 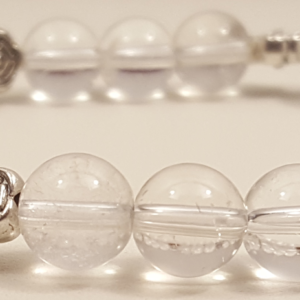 An elastic bracelet with moonstone beads. Moonstone is the gem of new beginnings. It supports and even awakens the wearer to their dreams and visions for the future. Its energy is connected to the moon and supports the wearer through the changes that each phase of the moon’s cycle brings; from new moon to the full moon. Through the ages and in various cultures, this stone has been used as protection for those traveling through land and sea. Spiritually, Moonstone enhances psychic abilities, lucid dreaming, and empathy. Its calming effects help soothe aggressive tendencies and help balance the masculine and feminine energies. Mentally, this stone brings awareness of sudden impulses and their connection to synchronicity. This stone helps the wearer recognize that their manifestations are being answered. Emotionally, Moonstone is very calming and enhances emotional intelligence. Its calming nature is great for people who tend to overreact in stressful situations. This stone is a strong emotional healer. Fort the body, this stone helps with upper digestive tract (especially when it is caused by stress). Because of its connection to the moon energies, this stone helps with fertility, menstrual problems, and health of feminine organs. This stone is also good to detoxify and strengthen fleshy organs like the liver and pancreas.